RioGringa may or may not follow in TiVoLady's writerly footsteps. Whatever. But she was just published, in a Chicken Soup for the Soul anthology, called, "Teens Talk Getting In...To College," with an essay about being wait listed almost everywhere. So, after being in the other hemisphere, on the far side of the globe, for one year, my spawn, a.k.a. RioGringa, has returned! We arrived at JFK at 6:58 a.m., only to find her already out of customs and waiting for us! This ushers in a new era of parenthood, for sure, because it's the first time ever that we weren't the ones waiting for her. . . She arrived with mountains of stuff, Brazilian chocolates and flip-flops galore, and a very glazed look in her eyes, a result of a sleepless night on a fully-booked plane. Make her lunch. Well, a bagel with cream cheese, which shocked her into asking me, "Is this all?" She's used to having her main meal at lunchtime, but I had to inform her that this was not our custom, and that she was getting just one luncheon item. Take her to Starbucks. She needed a mocha frappucinno, stat! Show her the Prius, which intimidated her so much she's refusing to try to drive it. Refamiliarize her with the TiVo, and inform her that it was all hers, until the hour of 7 p.m., at which time it reverts to being mine. All mine. To answer her question about an appropriate amount to charge for the translation of English into Portuguese. Uh, I have no idea. $50 a page? I have already budgeted today as a highly interruptable day, but I have to get back on track tomorrow, especially since I received a telephone call (unprecedented!) from my editor at Touchstone, wanting to talk about my (not quite written) book and some other deadlines I have yet to meet. Am I Cutting Edge, or What???!!! "How far people in the United States have to go to enjoy the variety of cachaça becomes clear with a visit to the Academia da Cachaça, a restaurant in Rio de Janeiro, where aged cachaças in the hundreds line the shelves and regulars carry a “cachaça notary” card that grants them special tasting privileges. There are 100 choices on the annotated menu, specifying the city and state of origin, the years of aging and the kind of wood they were aged in." Well, we were there way, way before ol' Seth--by at least a month! My Super -Cutting-Edge-on-All-Things-Rio Daughter, RioGringa, took us there for dinner one night. We had the ubiquitous, and mandatory, caipirinha with dinner, but we also had cachaca neat, in a small shot glass, sweetened with some honey and lime. It was delish--so delicious, in fact, that I did something I almost never do when it comes to alcohol. I insisted that we buy a bottle, on the spot. 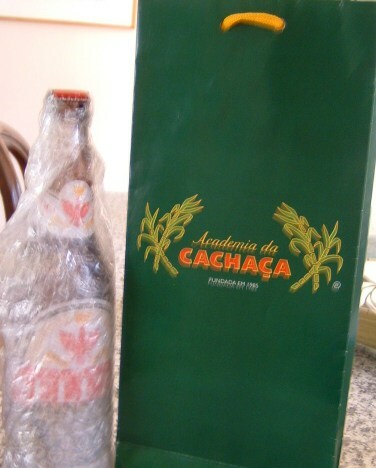 And I have a bottle of fancy cachaca, still in the original bag, to prove it!! As you can see, I haven't taken the actual bottle out of the actual wrapping yet.... We're not big drinkers here. Maybe I'll open it when RioGringa herself graces us with her presence... Or, when College Boy comes home for a brief stay, before starting his summer internship in Boston. Or, maybe I'll put it in the closet, and forget about it for a year or two. . .
Oh, and another thing about Rio...the eating. As in food. 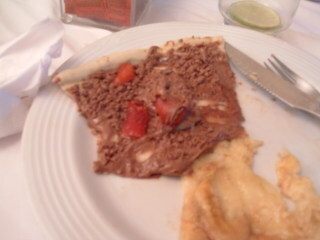 In our hotel, there was a wildly-overpriced buffet breakfast, that I thought cost fifteen reais (reasonable! ), but actually cost 50 reais (not!). That's, say, thirty dollars for some fruit and cereal. I only made that mistake once; after the first day, I skipped restaurant breakfast altogether and had mango juice and bananas in the hotel room. Quick, easy, cheap. RioGringa took us to several really exotic restaurants, including an African place in which most of the food was served either in exotic wooden bowls, or on rubbery banana leaves. The food was completely exotic, and rather mushy, as if designed for babies or adults with poor dental hygiene. Also, it was expensive, considering we were using our lowly and increasingly-pathetic dollar, instead of the robust, lordly euro. My favorite dish here was a brownish, gooey paste, something about roasted bananas. It was sweet and fruity and yummy. I will probably never see it again in my entire life! Another day, we had a hot brunch--not the food, the ambient temperature--in an outdoor cafe that was simple but delicious. Freshly-baked breads and rolls, with homemade papaya jam and cheeses. And freshly-squeezed orange juice. Also, a thick yogurt and granola, that I gave to RioGringa's dad, because I had ordered way too much food. The chef/owner of the place was Argentine, by the way, so there was a certain lack of Cariocan-authenticity here. 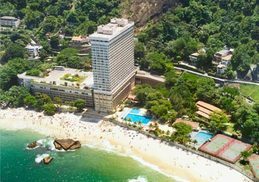 On our last day, we ate in a Santa Teresa restaurant; it was perched on a steep hillside looking out over much of Rio, had a stunning setting, and was all outdoors. As in: no air conditioning. The same held for a less picturesque place lower down in the same neighborhood, specializing in fish. A mound of couscous with avocado and fruits was heavenly, and so was the dorado with mango sauce. But, still, coming from the dead of winter, it was difficult to relish the food in such stifling heat. That did not prevent me, of course, from eating every bite on my plate. Oh, then there was the Academy (!) of Cachaca, an outdoor bar/restaurant that seemed to stock every bottle of cachaca ever made in the entire kingdom of Brazil. That's a "distilled alcoholic beverage," for those of you who've never had a caipirinha, well, too bad, you lose!! Here, we had the national dish of Brazil, feijoada, which is a black, gloopy stew of black beans and various meat-like products, that you pour over tasty long-grained rice. Then, you sprinkle this yellow, sawdusty stuff on top--it's called farofa, and is toasted manioc flour (whatever that is! ), and has a rather weird mouthfeel to it, at once yummy and gross. Oh, and there are also chopped greens to put on top, somewhat bitter, and it's probably kale. (Sorry to clue you in to this, RioGringa, but there's supposed to be pig tail in this dish--and I don't mean the hairdo, I mean the pork product!) It's served in colorful ceramic bowls and dishes, so the whole experience feels country-ish. Because we are Big Time Gringoes, we ate in a leetle, teeny air-conditioned room, with just four tables, and watched the outside diners, dozens of them in large family groups, raucously celebrate in front of us, as if we were pasty zoo animals they'd come to observe, but at a safe distance. Other than the fabulous, all-you-can-eat pizza joint, though, my favorite spot was the Confeiteria Colombo , a charming, turn of the last-century cafe in Centro. RioGringa dragged us there to see it, unfortunately not at mealtime, so we just had drinks and oogled like muddle-headed tourists we were. 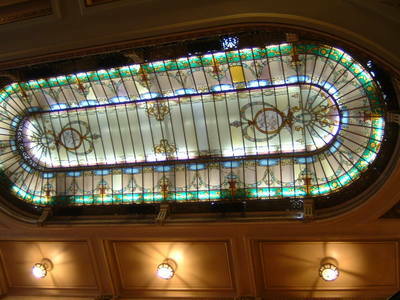 And there was a lot to oogle: fifteen-foot tall mirrors, encased in jacaranda wood, imported from Belgium more than one hundred years ago; stained glass ceiling, ornate, wrought-iron chairs and marble-topped tables. And the most exotic case of pastries I've ever seen: Paris and Vienna crossed with Cuba and Rio. 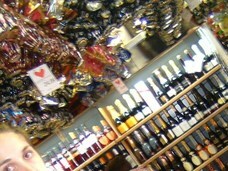 Guava tarts, marzipan cookies, empanada-like objects; I wanted one of everything. Instead, I had my first cappucino, since there was no decaf anything. And I couldn't fall asleep at all that night, at all. We need to take up a collection for RioGringa to return to this place--they sold beautiful, hand-made boxes for fifty dollars each. She needs one! I don't know about you, but I go through five stages of adjustment when I go on vacation. First, there's Anticipation Stage: I Google every beach in the hemisphere, and I price every exotic resort, every airfare, every rental unit and every hotel room. Then I add it all up and multiply by four: if it's a family vacation, we still pay for the two adult children. I'm always, always surprised by how much more it costs to take four people on vacation than to take two. When the so-called "children" are in their twenties, there are no more discount fares. Anyway, eventually, everybody agrees on the dates and the place and the time, and I book and pay for the trip. That's when the Regret Stage kicks in. It's this: Oh geez, I spent so much money and I picked the absolute wrong place to go. This is the "What Was I Thinking?" stage, and it can last for at least a week, but sometimes until the day the actual trip begins. It's a kind of buyer's regret thing, and I have never been able to figure out how to avoid it. Stage Four is Befuddled Glee. That's when I'm actually on the vacation, wearing rose-colored glasses, and believing that everything is perfectly perfect. Wonderful. Good food, beautiful rooms, gorgeous beach. Usually, it takes a few days for the rosy optimism to fade, but I seem to have little choice but to profess a passionate belief that I chose the Exact Best Place for a vacation. * (*The single exception to this rule was an ill-advised trip to Puerto Rico. Nevertheless, while not a great vacation, surely it was a memorable one, what with the un-airconditioned heat, and the endless distance to the beach, and the hilariously-expensive parking ticket incurred after that guy conned us into believing he was a parking official.) 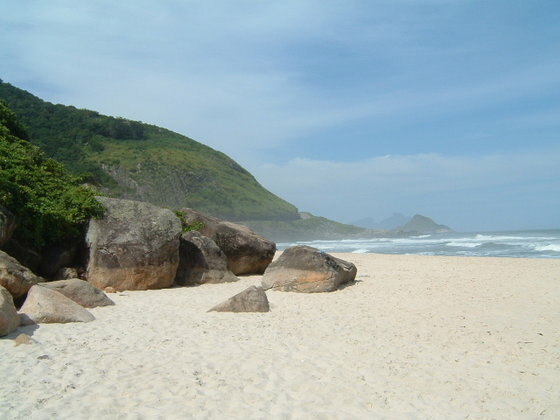 While in Rio, visiting RioGringa two weeks ago, I was in a constant warm bath of Stage Four, nearly drowning in self-congratulations about what a Fabulous and Perfect and Idyllic spot I had chosen to visit. Or, actually, what a great spot RioGringa had decided to live in for a year. Whatever. Finally, there's Stage Five, Unbearable Regret. 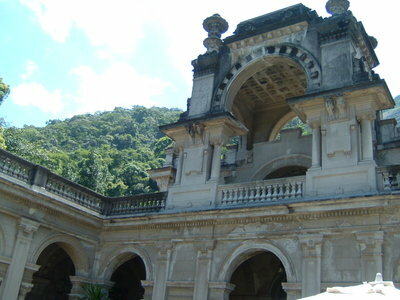 That's the stage I'm still in, after my return from Rio de Janeiro. See, this stage is when I self-flagellate about not appreciating the vacation enough while I was on it. It's when I am back home, and the whole thing seems like a passing blur, one that I can barely remember, although I only returned one week or two weeks ago. That's why I am obsessing on my photographs, which are great, but barely seem to capture the thrill of the trip. I need to go back for another few days, or a week maybe, or nearly a month, perhaps, so I can truly appreciate every single possible second. Maybe I'll call Continental Airlines, just to see if they'll fly me back there, gratis. I'll just say, 'Hey, I didn't appreciate it enough the first time around. Send me back. Please?" 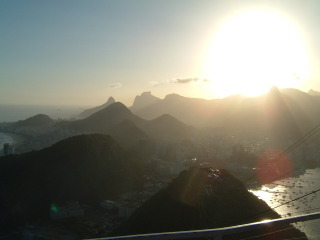 But here's the thing: if you go to Rio, especially with RioGringa, there are high heights everywhere. 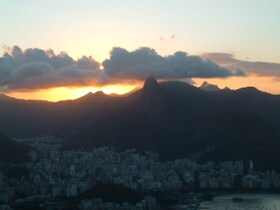 Rio is one big giant city on the sea, surrounded by heights. And, unless you climb up the rocks on crampons to those heights (horror! ), you gotta get up there by: cable car, taxi, walking, hiking, eye shutting. 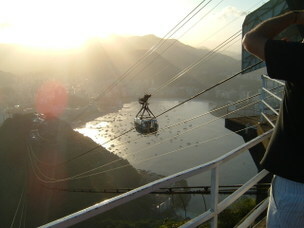 To get up to Sugar Loaf, or Pao de Acucar, for instance, you have to take not one but TWO cable cars. On cables. Dangling over jungly abysses. Abyssi? Take a look, if you don't believe me. By definition, of course, the views are spectacular. The problem is that you have to get up there to view the view. Here's the halfway vista. Lovely, right? But. Then, you gotta go to the next mountain: yep, there's another one. I was, like, enough already with the views! Get me outta here!! But, no, up up up we went. And, still, it was worth it--if you don't think about it too much. Right? Let me say, right now, for the record--and for RioGringa--that I am NOT complaining. It's just that I need to be forced/humiliated/kicked/pushed/shoved to go up to these places since I am not naturally a High Heights kinda person. And if I had not been forced, I would not have seen this. Or this. See? 1. 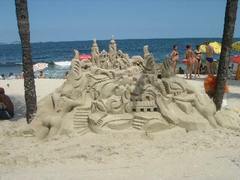 The sandcastles: professional sand sculptors make huge, six-foot tall statues out of sand, some with multi-colored titles; they're castles and mermaids and naked couples and amazing stuff. Most of this happens on Copacabana beach, and since we only passed by in taxis, and never on foot, I only glimpsed these marvels through the window. To RioGringa's horror, I was awestruck. She claims that the makers of these sand structures request payment to take photos--I would gladly have paid, if only I could have figured out how to say "Please stop the cab for a minute" in Portugese!! Thus, this is not my picture--but you get the idea! 2. The eterna-youth movement. See, many of the upscale people I saw in Rio looked caught in eternal youth amber. It was like L.A. only times one thousand. One woman in a fancy but obscure African restaurant must have been in her thirties, forties?, but her face was Dorian Grey frozen. No part of it moved, but it had no lines or wrinkles or imperfections, either. She wore teeny, tiny short-shorts, a crop top, and lots of jewelry. She could have been 24 or 44 or 64, who knows? Her husband was, I'd say, 45-ish, and she had a ten-year-old daughter. But maybe she was the girlfriend, not the wife, and... oh, it's just way too confusing. Let's just say that I saw lots of eerily perfect people. 3. The lack of illogical American products. Thus, no coffee without caffeine. No beer without alcohol. No chocolate without sugar. No "to go" cups, either. You buy a coffee or a juice or a tea, you drink right here. What's with taking it away!? Thus, the only place I found decaffeinated coffee--at the Sheraton Rio hotel--was a powdered Sanka product that the waiter showed me with pride. To take it to the room, though, he had to put the hot coffee in a plastic cup. I had to drink it, fast!, before the whole thing melted in my hand! 4. 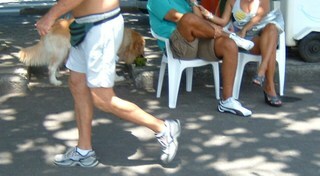 A transsexual person feeding his/her dog coconut juice. Out of the shell. See the dopey jogger who got in my way? Behind him, you'll see the hot and thirsty retriever lapping up coconut juice. 6. The Natural Beauty. It's true that wherever you look in Rio, there are signs of desperate poverty. But it's also true that wherever you look, there is pure natural beauty. We ate brunch one day, in the courtyard of an old mansion, inside a park. It was very simple, and completely charming. See for yourself. This was the view from our outside table, as we drank fresh-squeezed orange juice, and brewed tea, and ate our fresh baked breads with homemade papaya jam and herbed goat cheese. Yum. Also, lovely. Before I get to the fishes and monkeys and birds and flowers--Brazilian flora and fauna all--I must mention that it would be nearly impossible to be both a Boomer and a Gringa and to have a fabulous time in Rio if you don't have your very own RioGringa to show you around. There's the language issue--Portugese seems preposterous and impenetrable if your Boomer brain is stuck on Random Spanish and/or French and/or Italian Phrases. And there's the Safety Issue--if you don't live in Rio, it's impossible to tell where you should and should not walk while flaunting your digital camera and your fanny pack full of cash. That's why there are so many gigundo tourist buses full of gaping North Americans, travelling in gaggles to various sites, like a sixth-grade class on a natural history museum trip. Ugh. Because we were lucky enough to spawn a very clever and very linguistically proficient young gringa girl, we got to see Rio like natives. She was creative and efficient in her daily planning of our activities, clever about restaurant choices, and insistent that we take taxis to and fro. Without her help, of course, we were unable even to tell the driver where we wanted to go: How pathetic is that???!!! 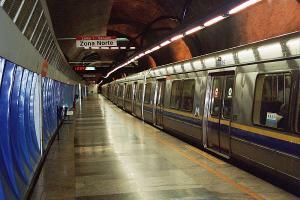 One day, she escorted us on the Rio Metro, a modern and efficient underground system that was cheaper than the New York City system, and also much much smaller. It even cheats, by showing a transit map that appears to show train lines, but actually includes bus transfers, because the train ends halfway before the map does. But the bus is actually waiting when you get off the Metro, and it's clean and new and air conditioned. 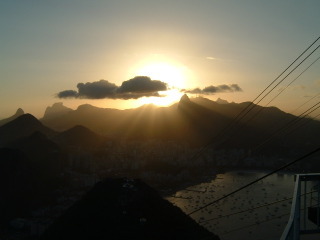 I felt almost like a Carioca (native Rio-ian), except without the ability to speak Portugese. Someday, maybe, we'll have little computer chips to implant in our foreheads, and we'll be speaking English, but Chinese or Portugese or Korean will come out of our mouths. Or maybe not. Anyway, here are some south-of-the-equator, exotic and mysterious wildlife that RioGringa showed us. 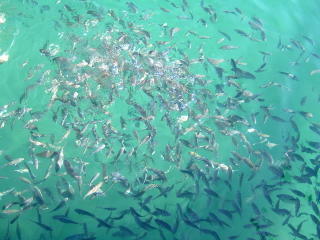 First, the fishes. What's amazing is not that they are swarming by the boat like this--there were crackers involved here--but that the water, a bay off of the Atlantic Ocean, is this amazing color. Look carefully, and you'll see the teeny monkey in this photo. I assume he lives off of tourist detritus, like chips and bottled water and little packaged cookies. Or, maybe, he prefers burgers. Anyway, without RioGringa to show us the secret path to the hidden jungle atop Sugar Loaf, we'd never have seen him. Score! Finally, I'm not a Bird Lady, by any means, but I enjoy seeing birds that are unfamiliar or special, to my very untrained, astigmatic eyes. 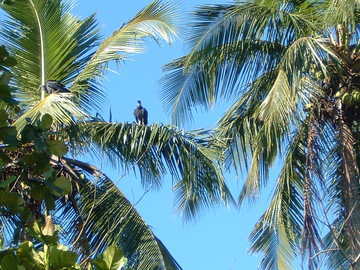 And the bird species in Brazil are among the most varied in the world, apparently. 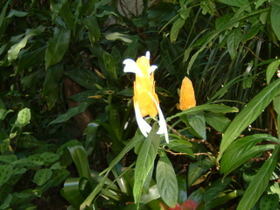 Every so often, I'd see a bright yellow bird flitting by, but no parrots, though RioGringa swears they are there. 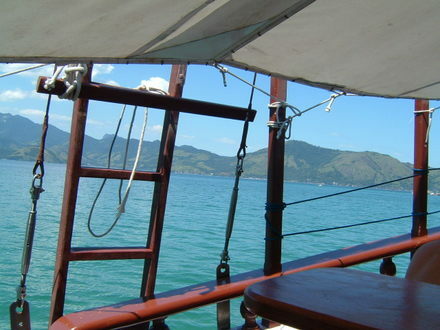 I did, however, see this thing on the remote island we visited by boat, near Angra dos Reis. At first, I thought it was a vulture, but I'm told it's some kind of hawk. Or, it could be an osprey or an eagle or a harrier. In flight, it was huge, with a hooked beak, and great notched, white-tipped wings. Whatever it was, I was duly impressed. Then again, it doesn't take much to impress me. Every time I'd see a flower, for instance, I'd run over and take a picture of it. 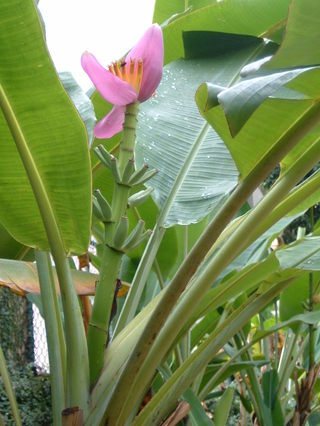 The palm trees are lush, Bird of Paradise and bamboo grow like weeds, and all of the greenery looks as if it has been lovingly tended in a greenhouse, only it's just growing in a weedy patch on the sidewalk. If you're sick of winter, then look at this. If you are RioGringa, young and spritely and full of life, then you are fascinated by Brazilian samba and dancing, Carnavale and clubs, nightlife and drinking. If you are RioGringa's mom, though, Rio Boomer Gringa, then you are fascinated by Brazilian toilets. This is just a fact of middle-aged life, I am sad to say. The thing is, the digestive process enthralls us Boomers, despite our resistance to the idea that we are growing older and more constipated and more concerned about our bodily woes than about the weight of the world. Whatever. In Brazil, the toileting issues are major. First, there's the toilet tissue issue. It's thin and harsh and completely non-absorbent. Also, you are not supposed to flush it. That's correct: you are not supposed to flush the stuff you use to wipe. As a Boomer, I could understand and appreciate the sanitary ramifications of this issue; but also as a Boomer, I could never remember to not flush it. Maybe if the toilet paper had been imprinted, in English, with the words: DO NOT FLUSH! then, I might have remembered. Also, there are little showery spray things next to some toilets. I always meant to use it, but I couldn't remember to do so when the time was right. So to speak. Probably, you're supposed to use it instead of the paper. 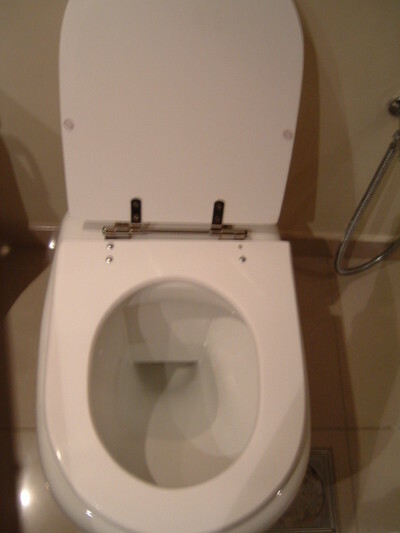 Finally, there was the shape of the toilet, and the seat itself, far from trivial concerns. RioGringa herself did not notice the vast discrepancies in toilet seating, but Boomer Gringa did. Take a look. See? It's a wider opening, but a narrower seat. And there's barely any water in there. You can see part of the shower hose, too. It's conveniently located right next door to the toilet. There's no separate bidet fixture, just that hose and the oddly-shaped toilet. And the unflushable paper. Could be there's a book here: Toilets of the World, anyone? Let's talk about those Brazilian pizzas. I'm making a big deal about them because they are so, well, amazingly great. And in a whole different pizza universe than North American pizzas. Ours are: large, puffy, oily, tomato-y, thick, heavy. Theirs are: smallish, flat, oil-free, tomato sauce-free, thin, light. Their pizzas seem to barely have yeast, they rise a microscopic level, and the crust, such as it is, is barely discernable as crust. 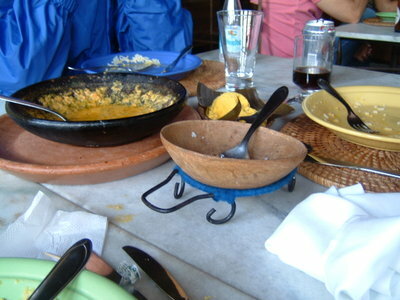 Nevertheless, Brazilians daintily cut off the edge of the pizza--the so-called crust--and leave them in a pile, uneaten. Also, we are talking Pizza Rodizio, or all-you-can-eat pizza. If you are thinking of American pizzas, this is a somewhat gross idea. But we are not talking our pizza; we're talking Brazilian pizza. Thus, there is a very delicate layer of cheese, or shaved bits of chicken or ham, some miniature pieces of hearts of palm, razor thin slices of tomato, tiny shards of broccoli. Waiters race from table to table, balancing the pies on small metal pans, each one surrounded by a kind of metal edge, and swoop it down to the table to see if you want any. If yes, they seem to scissor away a piece, and it's magically on your plate. Look closely, though: those aren't scissors, they're two knives, cleverly slicing together in an imitation of scissors. I don't want to idealize Brazilians, or their pizzas, however. There is a dark underside to this story: it's the condiment issue. 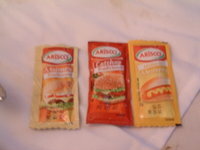 On each table, I am sorry to say, there are packets of condiments that some Brazilians apply to some pizzas. We don't know, exactly, why. At the height of my adoration of this Pizza Ideal, I experienced dismay at this notion. Thus, this photograph. Do not look at it if you have recently eaten--you may be sickened!! Yes, dear reader, I kid you not. This is: ketchup, mustard, mayonnaise. To put on top of pizza. Well, no culture is perfect, n'est pas? 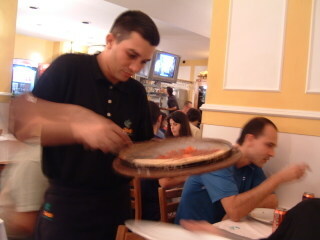 The crowning glory of Brazilian Pizza, as far as I'm concerned, is what comes at the end. After you have eaten your fill of cheeses and vegetables and bits of meat, after you've consumed your beer or your Sprite Zero, you are not quite sated. (Brazilians do not waste food, and do not take more pizza than they can eat, ever. Except for those funny little crust-like objects, which they do not eat.) And thus, we come to the sweet pizzas. At the place we had our pizza, called Deck in Copacabana, right on the beach, we were served both banana pizza and chocolate/strawberry pizza. Before you recoil in horror, be advised: they were delectable and delicious. In the interest of international research, I was forced, of course, to try one of each. Here's my proof: take a look. Because the crust is thin, with no oil, these pizzas are more like crispy crepes. Only better.